Some kids from SCAD are coming to visit the studio* tomorrow. I think this will be the third year they've stopped by Brooklyn. 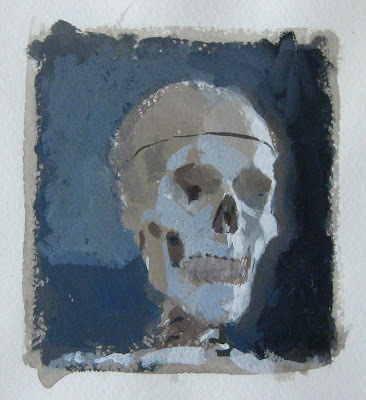 I painted this skull as a demonstration when I visited the school in 2006. Now it haunts my Mom's sewing room in our house in FL. I seem to remember painting this pretty quickly. That's the excuse I'll use for not painting the teeth. Painting from life seems pretty easy to me now. Nowadays, I don't have the luxury of my subject matter existing in front of me. Is Lowe taking kids up there, or will Duncan be doing it now, now that he's the head of the department? Very cool, visiting another artists' studio is a great experience. As a student you go in their hoping some of that talented mojo that floats in the air will land on you. Haha or at least I do. Manny, I'm always tempted to go with them to the studios of other artists in the city, but I usually can't find the time. Before visiting us today, they went to see Sean Chen and Bernard Chang (and I was jealous).